You must make reservations at least 5 minutes in advance of the time at Härth. My parents had a lovely time for my mom’s birthday. The service and attention was outstanding. Very relaxing. Outstanding! I didn't even know about this restaurant until I saw it on Open Table. It's right around the corner from my boyfriend's office so I arranged a dinner date there. 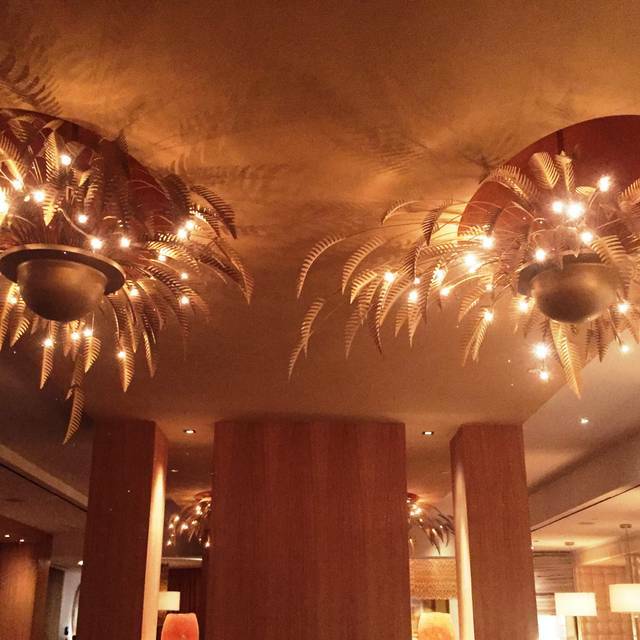 We loved the decor - including the fire cases, palm frond ceiling lights and raw wood accents. Very cool and cozy. We enjoyed the unique bacon jam, and butter with black sea salt served with the bread basket. All of the food we tried was delicious and creative - we had the octopus and a flatbread for appetizers, quinoa salad and roasted chicken for entree, and a flourless chocolate cake for dessert. Excellent! This is a hidden gem inside the Hilton Hotel. We'll definitely go back. Very pleasant first visit ... probably not the last. Menu very limited. My trout was over cooked —dry and no taste. Vegetables over cooked and lukewarm. It was not very busy but the service was slow at the moment of chec out. Ideal for 2! Awesome date! Enjoyed the Quinoa Salad with salmon and had a bite of my friends Wood-fired fiat bread of the day. Everything was delicious, service was attentive but not too much, and lovely atmosphere. Looking forward to returning with friends or having our next business lunch there. Highly recommend for business, romantic date, or time w/ friends. 3 of us ordered the Pappadrelle Ragu and we all agreed that the dish was very disappointing -- the pasta was overcooked, the shortrib was chewy and the tomato sauce had no depth/complexity -- it tasted like it came from a can of tomato sauce with no enhancements. the 4th in our party had strip steak which he said was excellent. we all agreed that the flat breads were excellent, as were the desserts. The server was understanding, and very attentive -- he conveyed our comments to the kitchen. Harth should take this dish off the menu ! Under appreciated Tysons corners hotel restaurant. Very quiet on a Friday night, which was great. We had a great dining experience and the food and service was very good. I would recommend and dine here again. Harth is a favorite when our "Group" gets together to celebrate Birthdays and other special events. The table size is always great for a party of 5 or 6; and the food is great. We always have lots of conversation -- so we ask for the meal to be "stretched out" since no one is in a hurry; the staff always accommodates. Since the menu has some continuing favorites as well as some new additions and chef "daily specials" there is always somethi8ng for everyone. 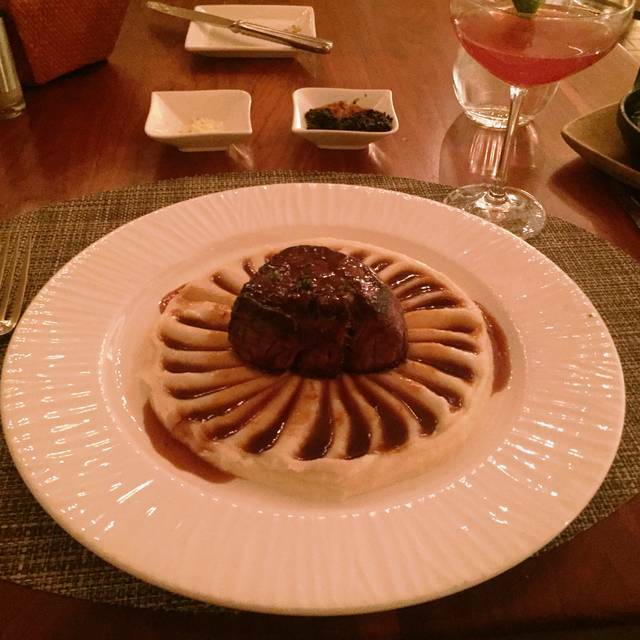 Harth never disappoints! Excellent food! Interesting and tasty cocktails, the fried calamari appetizer had a lovely, light batter and although I was skeptical, the fried bread and butter pickles that were part of the calamari dish were very good! We decided to share a mushroom flatbread as another appetizer which was delicious. We probably could have stopped there as the portions were very generous but went on to order the main course. We ordered three different dishes, all good. The apple pie for dessert was incredible and large enough to easily be shared among four people. Service was quite good as well and the recommendations were spot on. Interesting decor, with some tables next to large gas fires behind a glass enclosure, very cozy. We will definitely be back! The food is the best thing about this place. I was there for lunch on a Tuesday. The place was crowded and way too noisy. Our server had too many tables to take care of and that of course meant we got very little attention; we even had to ask another server for the check when ours was nowhere to be found. Very good food and a lovely ambiance. Love the fireplaces! 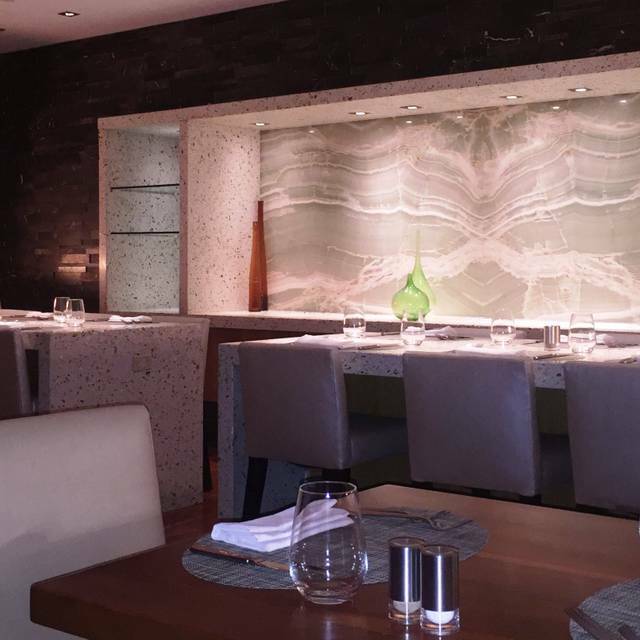 Harth impresses with its farm-to-table cuisine. As you enter the restaurant, you can admire their hydroponically grown greens, which are served in their salads and sides. On the rooftop of the building, they maintain 200,000 honey bees (under the domain of four queens), who produce the honey used in their cocktails and desserts. Harth is a restaurant that prides itself on using high quality, locally sourced ingredients, that are presumably fresher and more delicious than commercial ingredients sourced and shipped by traditional suppliers. Perhaps more importantly, the food itself is delicious. My wife and I ordered their roasted octopus, heirloom pork chops, and NY strip steak, and were impressed by everything. The steak in particular was spectacular. The kids menu was also a hit, with the roast chicken being a top pick. The food was a little slow to arrive, but I chalk that up to the chef's deliberation. Service was excellent, and our waiter was Juan, who was both charming and knowledgeable. He also recommended and comped us a delicious dessert with a piped chocolate congratulatory message when I mentioned it was my wife's birthday. 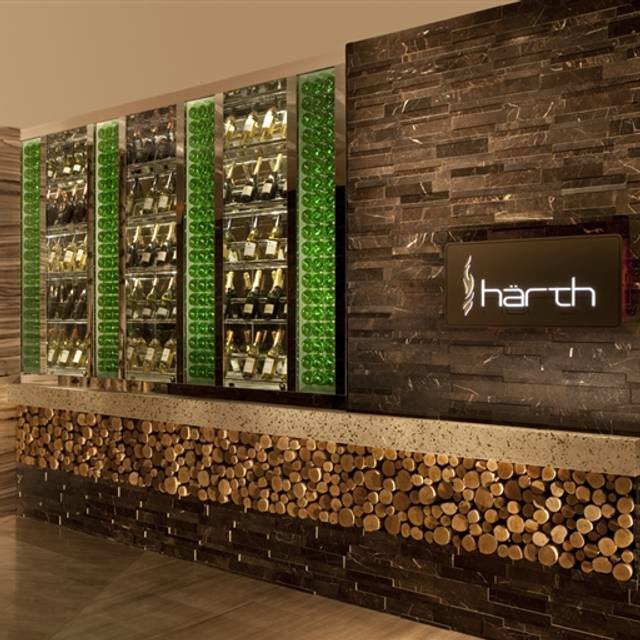 Harth is located in the Hilton, but is well worth a visit for those not staying at the hotel. The decor and atmosphere were well suited for a date night, with banks of glass-enclosed fireplaces embedded into several of the booths. For a special occasion, I recommend requesting seating in a booth with one of the fireplaces. Have been a consistent diner at Harth and always recommend it! Food choices change frequently -- which makes for a great menu selection; the weekend dining ambiance is always quiet and the staff professional and attentive. Parking is convenient and they are always gracious and friendly. The service, food, and all atmosphere were excellent for a family dinner just before driving to Marla d. So we have a wonderful experience in a beautiful setting. Only had the octopus appetizer & a cocktail, particularly since there weren't many more gluten-free pescatarian options, but that was fabulous. Service was excellent as well. I was disappointed with my experience at Harth. The staff seated us in a very odd location that seemed to be at the Cross roads for a lot of patron and wait staff traffic. We were constantly being bumped into. The night we went, our service was very slow. We had to ask for our waiter several times. It seemed under staffed that night. Overall, I couldn't pick out any high points. Our server Maria was exceptionally good. The ambiance is excellent. We will definitely return. Such a great little find. The flatbread pizza was really good. The pan seared octopus was amazing with the curry cauliflower. What really sent it over the top was the warm bacon jam with bread. Wow! Service was phenomenal. Would definitely recommend. 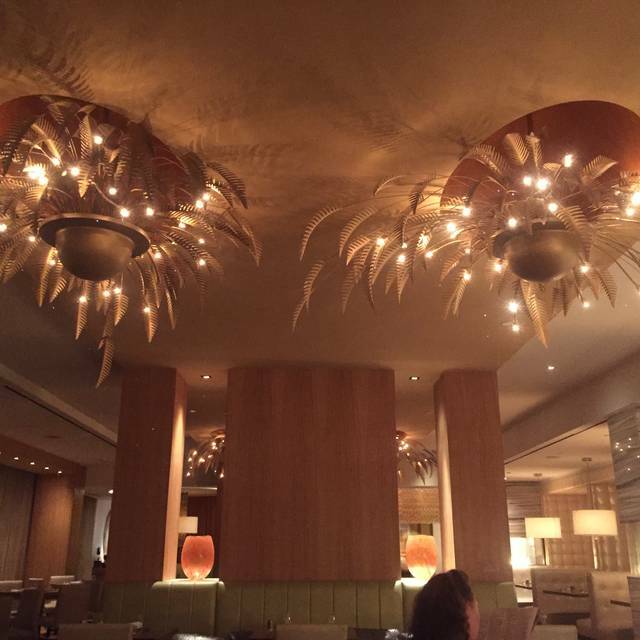 Have been to Harth several times -- and have always enjoyed the food, the service, and the ambiance. Definitely plan to return. Choosing the meal a la carte can be potentially pricey, but the family meal option and the prix fixe are great options with selections for everyone -- they are worth the price. Initially (on this visit) we had barely received the bread when the appetizers arrived. But when we indicated we wanted the meal to slow down -- the opportunity to relax and talk and have a leisurely meal, the timing was adjusted and it was a great dining experience. A shout out to our server Yosef; had had him in the past and he is a delight to work with. The octopus, the pork chop and the duck breast were all excellent. And the sticky toffee pudding was likewise great. Highly recommend Harth for a wonderful dining experience. The server and cook went 100% out of their way to make sure that this gluten sensitive gal was accommodated even when I didn’t make a request in some instances. They wanted to make sure I could enjoy dishes I didn’t think I could. Did I mention the Bacon Jam!!!! Everything was so warming and made us feel comfortable as guests the food was amazing! Maria is a terrific waitress who always takes good care of us. The breakfast buffet is excellent and has made to order omelets and/or eggs from the kitchen. The staff is lovely. Our waiter Solomon was fabulous. Terrible menu. Appetizer meatballs terrible. Food was as wonderful as always, and service paced for the special celebration. Excellent! Lovely restaurant with excellent service! We had a scallop special that was out of this world. Juan gave us perfectly timed and attentive service. We sat outside, by choice, on a nice summer evening. An airport shuttle bus pulled up and sat idling, spewing fumes at us, for at least 15 minutes. Our waiter rushed us all evening. Beginning when we arrived and were just sitting down, he was already showing us the drink menu and telling us the specials. Several time we told him we were not in a rush. (It was not a crowd issue - most tables were empty) He was constantly coming by to see if we wanted to order anything else, and grabbing plates away the minute each diner set down his/her fork (a no, no in the restaurant business). Appetizers were good but main course duck was way too salty. We will never go back! Excellent service. Food was delicious. Wanted to catch up with friends and found a wonderful place for conversation and an good brunch buffet. The made-to-order omelets were cooked perfectly as were the waffles and breakfast potatoes. Nice selection of fresh fruit, croissants, and desserts.